There has been a lot of hype around this new toy. It has had a lot of press coverage and has been rated as potentially one of the most sought after toys for Christmas 2014. It is a cheeky little toy, which will keep you and your kids (!) entertained for ages. Well it’s the new Xeno, the baby monster, who loves to be played with. I was lucky enough to be invited to a Xeno event, at London Zoo. 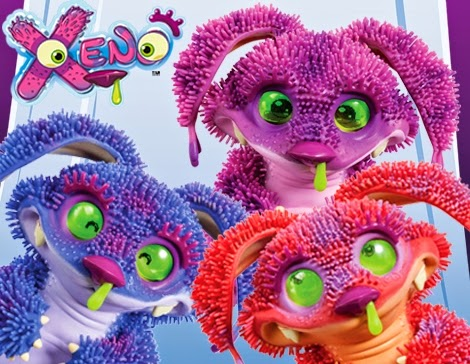 I had heard of this toy and I was intrigued to see whether Xeno could live up to the hype. Xeno comes in a three colours: blue, burnt orange and violet. So a colour for all tastes. Seeing the toy in the flesh, (so to speak), was completely different to the pictures I’ve seen in the press. I didn’t realise that Xeno had soft, stretchy, tactile ‘hair’ surrounding the whole of it’s body. This gave Xeno an extra huggable factor, and also it meant that if (and in our household’s case, when) someone falls on this toy, it won’t actually hurt so much! The ‘hair’ around the body is where all the senses are for activating the monster’s moods and feelings. There are plenty of features to this little monster….monster features to be exact! When being played with, the ‘hair’ activated the senses, happy, sad, angry, playful etc etc. All the senses and feelings we have. You can tell what ‘feeling’ Xeno is having by reading his eyes. If it is sad, you can see tear graphics in the eyes, laughing means it giggles etc. Just watch it’s eyes. It is also a little cheeky monster, with some great dance moves. Play some music near Xeno and watch him dance. But, watch out, if he doesn’t like the track he won’t be interested, so make sure you choose something he likes! If you press it’s belly button Xeno will burp and if you pull his tail he will fart. The kids, for obvious reasons, loved this. They aren’t totally grotesque noises thought to be honest. I’m guessing as he is a baby monster he can’t do loud burping and farting noises just quite yet! You have probably noticed that green snot hanging from Xeno’s nose. On first impressions I thought this was just a visual snot, which again the kids love. But, in fact if you pull on it while on certain modes it will trigger or functions (e.g gaming). Controlling Xeno’s mood swings and dancing are not the only things you have to do. There is also an amazing Xeno app which you can download, for free on your ipad or similar device. The Xeno app is great, it’s child and parent friendly. Meaning, that it really brings a different dimension to the toy, but also it’s free and there are no in-app purchases. 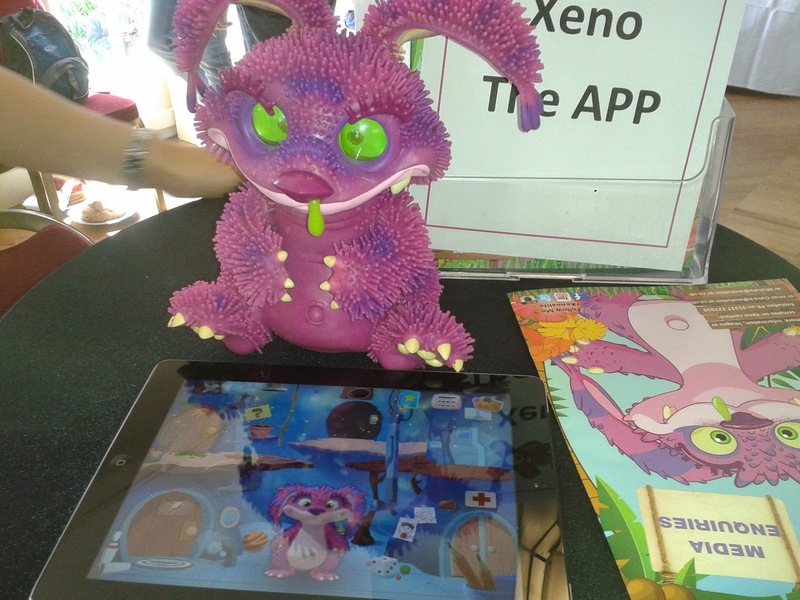 The games are unlocked by playing with Xeno and the app, so children can discover more elements to the app without it costing anything. One of the areas which Xeno on the app can visit is the doctors area. If Xeno the toy sneezes you can ‘take’ the virtual Xeno to the doctors and it will be fixed. The toy uses an infrared signal to link to the ipad or device. Just make sure the toy is quite close to the device to keep the signal strong. Xeno has five games to play. Xeno will say “wanna play” when in game mode. One of the games we played was where we had to watch the eye movements and copy each sequence by using its arms, head and snot, signifying top, left, right, top and bottom eye movements. The games are rather fun and addictive. If you win, Xeno gets upset but if he wins he gets very happy. He loves to win. So you have to try hard to beat him! Another feature is that if you place two Xeno’s facing each other they will ‘talk’ to one another. Cool! I can see how this is a must-have toy for 2014. It is a great looking and feeling toy. Has great features and isn’t just a one minute wonder. With the free app, and games this toy will easily still be played with well into Christmas 2015. Disclaimer: I was invited to an event, showcasing this toy. All my views and opinions are my own. Teenage Mutant Ninja Tutles – competition time!